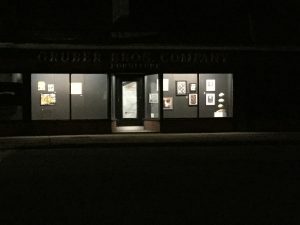 Last weekend a total of 33 retailers, restaurants and other businesses in downtown Concord, MA, displayed the artworks of over 30 artists on August 11, 2018. In Albright Art, a local oil painter, Sonya Walters, worked on a still life painting. My work was on display at Revolutionary Concord and I gave a talk regarding my series of watercolors and pastels on the Old North Bridge. When the date was planned, there was no idea that it would occur the same weekend as the MA Tax Free weekend. Obviously because it was a tax free weekend the normal flow of customers was a bit slower as many would be going to larger stores in the morning looking for great deals on televisions, computers, and furniture as an example. There were a few times a good flow of people came to view the works on display. I think working on a live piece for Sonya was a good idea. From my vantage point, it seemed like a nice group came to see what she was working on during her four hours at the store. I was a bit worried that my talk would not have anyone attend. As I began my talk, I believe it was just myself and the person filming the video for Facebook. Luckily, a few people came in as I was speaking. I was happy people came in as it did make it easier to speak to a real person and not just the iPhone filming. I’m hoping other Art Walk artists enjoyed their time. I didn’t have a chance to walk around during the actual Art Walk event so I’m not sure if Artists gave talks, worked on live pieces or just were available for questions. I was able to see a few of the works before the event began, which was nice to view. 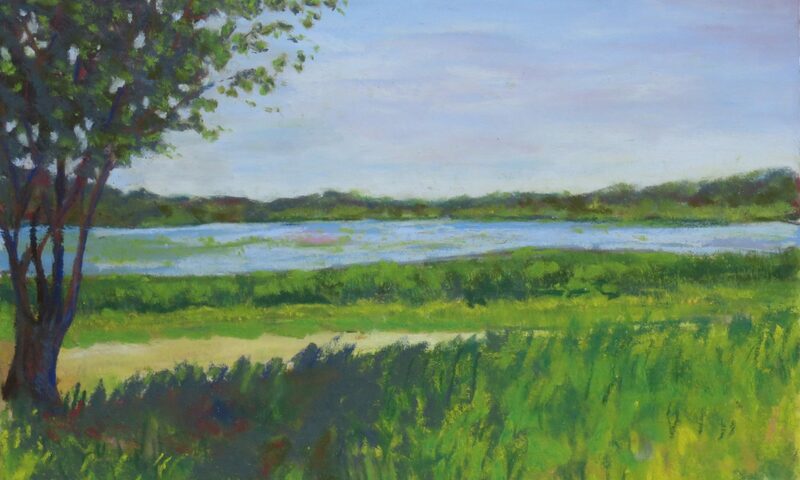 Listen to Sonya speak about her work as well as see my talk about my pastel and watercolor series on the Old North Bridge. Occasionally I will use one of my iPad apps to figure out how to edit a project before I make the actual changes. I’ve done it with charcoals and have started to do it with my pastels. While there are times I edit directly on the artwork, using an app helps me add and delete parts when I’m not exactly sure what edits I need to make. 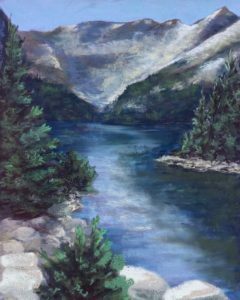 In this pastel, there were a few areas where I created ‘unfortunate tangents.’ These tangents are the tops of foreground trees hitting the mountain range in the background. Sure, you could keep these trees as is but sometimes it’s better to make changes to make the piece more visually pleasing. As you can see, I used my ArtRage app to suggest possible changes. The second photo shows how I made some of the edits. 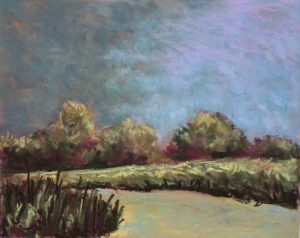 After a critique today, I decided to make changes to another pastel because its composition wasn’t as strong as it could be. The group mentioned the tree on the left side was cut off a bit too much and all the other elements in the foreground followed the same line. See first photo below. This line was also echoed in the reflection in the water. The suggestion was to visually cut up the area from the tree to the rocks and bush in the foreground. Using the app again, I made various edits to make the piece more compelling and draw the viewer into the piece. See second photo below. All that’s left to do is go to my pastel and make the actual edits. Note: if you haven’t heard of tangents in artwork, here’s a blog entry with visuals to explain what it is. When sharing artwork in a critique, with friends or visitors to your social media, should you share the step by step work in progress or only the finished product? 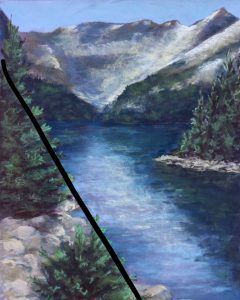 During a critique, I displayed one of the works where I had just added a few strokes of color on top of the underpainting along side a finished pastel. It was suggested if we had the time to work on the piece(s) when we got home, we should. The idea was you were still in the same mindset when the piece was initially created. I tried the suggestion. I went home and worked it. When I was finished I thought I’d share with someone from the class. The reaction wasn’t what I was expecting. The part that the group liked when I showed it at the critique was no longer there in that person’s view. Admittedly, I was disappointed. When I viewed it I thought it had the same palette and feeling as the finished piece. Certainly they were two different subject matters but they seemed to work together, which appealed to me. I took a few days away from that piece thinking about what was said. I tried to recapture what was thought to be the best part of the piece seen at the critique. I found it hard to work on it as I couldn’t get the coloring or marks the same way. I haven returned to the piece yet. My thinking is that by taking more time away I’ll stop thinking about what was said. I’ll start to see the pastel separate from the comment and begin to choose the coloring and marks based on how I feel towards the piece as I’m working on it. At the beginning of June I began a new pastel. 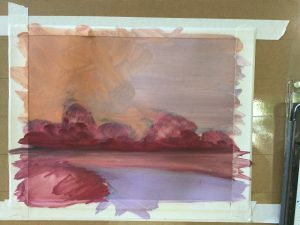 This photo shows the underpainting of the pastel. As soon as the underpainting dried, I began working on the pastel. It’s based on a scene of a wildlife refuge I visited during a recent trip. A storm was approaching. Luckily we didn’t get stuck on the storm and only encountered a small section of it. We went the opposite direction. As I worked on the piece, the storm clouds didn’t look as I wanted. Also, I wasn’t sure if the grassy area in the foreground looked quite right. I stepped back from the pastel for a few days. Yesterday, I came back to it. 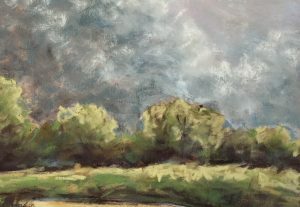 The detail of the pastel shows that the clouds are more intense giving the viewer a clear indication a storm is approaching. Obviously taking a few days away from a piece can end up changing the entire piece. The clouds changed dramatically, which in turn made me realize I needed to change the colors used in the trees and grassy areas. The colors had to be cohesive and work together as a whole. Next spring, I have an opportunity to exhibit my pastels at a nearby library. I met with one of the volunteers who selects exhibiting artists. The work I showed her was from my Journey through Open Spaces exhibit (August–September 2017). I’ll continue with the theme of landscapes but realized it would be nice to include new work. I am finishing one pastel and have ideas for two more. Since this exhibit will not happen until late March/early April of 2019, I have time to work on a number of pieces. In addition to this exhibit, I submitted work to be considered for two other exhibits. 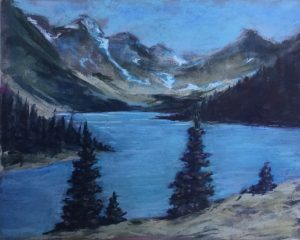 One exhibition was originally scheduled for June 2018, which I had submitted a few pastels back in March. Due to unforeseen circumstances, the exhibit was rescheduled to late summer/early fall. I’m thinking by September I should hear if any of my pastels were selected for this exhibit. The second opportunity is with another library. The committee is reviewing all submissions and will contact approved artists within the next few weeks. They are selecting artists for their October 2018–October 2019 art exhibition schedule. Do you bring art supplies on a trip? I considered bring some art supplies with me on a recent vacation. I even went as far as putting a small notebook and watercolor set off to the side of my suitcase. I was tempted to bring it with me but at the last minute I did not tuck the supplies in my carryon. This vacation was not a specific art trip. I’ve heard of trips specifically geared towards artists but have never tried one. 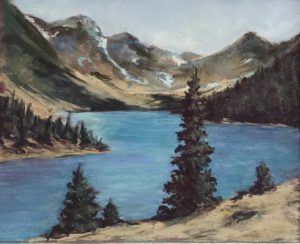 Those trips give artists dedicated time each day to paint or draw. 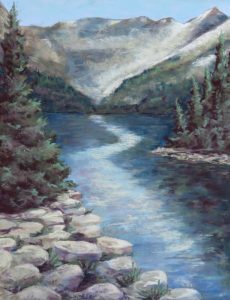 I’m looking forward to hearing from a colleague who will be traveling in a few weeks on a painting tour. She’ll be able to give me a better idea how much time was spent each day creating art, what other things the group did during the afternoon, and did she find creating art while on a trip easy. Perhaps on my next vacation, I’ll at least bring a sketchbook and pencil with me to slowly ease myself into bring supplies when traveling. What would you do once artwork is completed? If you are able to and want to sell your work then by all means sell it. Some artists sell their work to friends or have it purchased by an admirer after it is viewed in a local exhibit. It’s not always an easy process but a person can try selling their work. Some artists may chose to keep their art. If you keep it, what could you do with it? One option is for the artist to display their artworks at home or in the homes of family members. Unfortunately there’s only so much wall space at home. It’s at this point you pack away the framed pieces and stack up the individual pieces. Perhaps you can display it another day by rearranging and packing away other pieces that previously hung on the wall. Clearly something will be packed up and stored. If you feel the artwork was only an exercise having no emotional connection to the piece you could toss it in the trash. The third and forth options are not difficult for the artist but for those hearing those options were chosen. I, myself, have on many occasions stacked up and packed away artworks after an exhibit. When I told someone I packed up my artworks after a recent exhibit, this person was surprised and questioned why I did it. I felt as though I had to defend the reason for doing it. Not every artist is able to sell their work or sell it right away. While you can actively exhibit your work, there will be times you are not selected to display your work or there may be weeks or more between exhibits. Tossing an artwork seems to be another taboo. At the end of a recent class one participant tossed out a piece she completed during the day. Another person was cleaning the tables and noticed the paper in the trash bin. “Who threw out their artwork?” rang out in the studio. A number of participants looked shocked that a piece of art was in the trash. The person replied she had placed it in the trash—she didn’t need or want it as it was only an exercise in her opinion. She turned to me and said she had no emotional connection to it and no longer wanted it. It was completely her decision to do whatever she chose with her piece even though many others were surprised by her action. There are a few weeks left to this exhibit to check it out. In my first blog for the new year I mentioned a few Exhibit opportunities I would try. I entered into a members juried exhibit. As with any juried exhibit you never know if your work will be selected. The pastels I entered were not selected for the exhibit. I entered another juried exhibit. Over a week ago I found out my work was selected for a Pop-Up Exhibit. It’s my first time in a Pop-Up Exhibit. I wasn’t sure what to expect. I dropped off my artwork expecting to be on location to help display my work. The person in charge told me I didn’t need to stay. When I was selected, I was told the artists would help clean the space and hang their artworks during 10 am – 2 pm on Saturday afternoon. I arrived at 10 but by the time I left only one other artist delivered their artwork. I’m not sure if the others realized the delivery time was 10 am with a displaying time frame of 10 am – 2 pm. Granted it all depends on what the artists were told. I checked out the exhibit on Saturday night. Since less than half the artworks were displayed, the lights to the exhibit were turned off. When I checked again Sunday night more artworks were displayed and the lights were turned on.